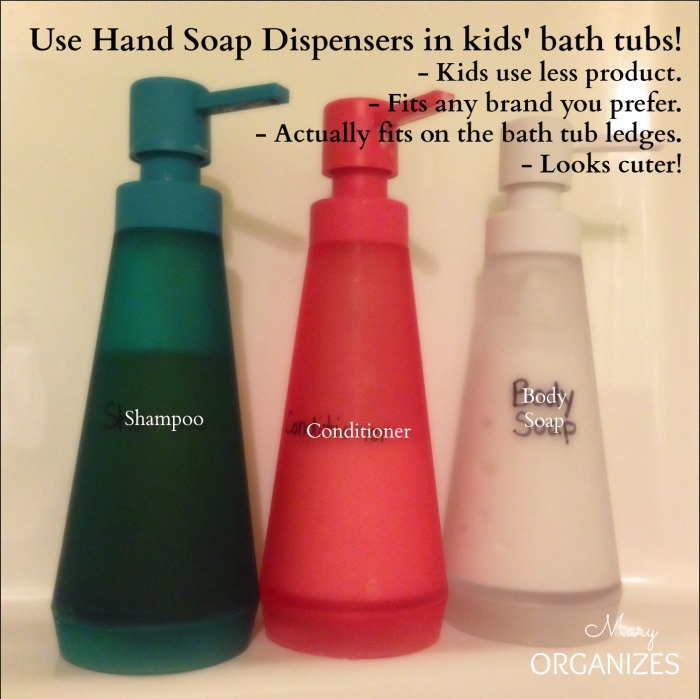 Use Hand Soap Dispensers in the Bath Tub! Are you organizing or decorating your bathrooms this week? While we are focusing on “the most pleasant rooms in our homes”, I thought I’d show you a simple and quick tip for organizing kid’s bathrooms. I don’t know if you have a similar problem, but my kids can go through a bottle of soap or shampoo or conditioner in 3-4 uses. They have no concept for enough is enough! It can get expensive when I want them to use stuff that isn’t full of awful chemicals. The nicer stuff tends to cost a little more and I want it to last as long as possible, so I can keep it in the budget! Also, so many of the bottles out there don’t even fit on the little ledges in a bathtub. Know what I mean?! To solve these problems and add to the cuteness of the decor, I use pretty hand soap dispensers in the bathroom. This way I can buy whatever soaps and hair products I want my kids to use, and not just shop for skinny bottles with pumps. I actually keep the bottles up on the ledge on the wall, but that made a terrible picture, because it just looked like a white background. I used a permanent marker to write what is what and different colors to make it even easier for them to use the correct product. That’s it! See, totally quick and easy! Go ahead and make your life easier, less expensive, and way cuter. Where did you get your cute dispensers? Great Idea! Where did you find such cute bottles? I agree totally! We’ve used this idea for several years, ever since our 2 girls could barely reach the 2 small shelves in our stand-up shower. I set up Softsoap hand pump bottles (clear with fun colorful fish decals on the front) labeled with a Sharpie marker for Shampoo & Conditioner. It’s easy to see when to refill. Also easy to just pump and dispense the right amount versus oversized caps on jumbo bottles purchased to save money. They also fit well on the tiny triangular shelves built into one corner of our camper shower. Your color-coding idea is a good one too. I enjoy your blog – very inspiring! Thanks for the ideas… Sandy S.
Great idea for adults. I don’t see well without my glasses and I don’t wear glasses in the shower. I always wonder is this the shampoo or conditioner? But a different color for each would show me right away without having to read the tiny print on the label. Yes, the color coding really helps everyone! GENIUS! I’m totally going to try this because my 12 year old still doesn’t understand “enough”! It has really helped us! Hope it helps in your house too!